Pear Therapeutics (PEAR), the creator of prescription digital therapies called eFormulations, announced today results from a real-world implementation study examining a research version of THRIVE, PEAR’s digital therapy for treating patients with Serious Mental Illness including schizophrenia, schizoaffective disorder, and bipolar disorder. The study was led by Dr. Dror Ben-Zeev PhD, Director of the mHealth for Mental Health Program at Dartmouth College and Associate Professor of theDepartments of Psychiatry and Biomedical Data Science at The Geisel School of Medicine at Dartmouth College and colleagues. PEAR has partnered with Dr. Ben-Zeev to bring cutting edge treatments through research studies and into the hands of the patients and providers who need them most. The study, published as “mHealth for Schizophrenia: Patient Engagement With a Mobile Phone Intervention Following Hospital Discharge1“ examined the engagement of patients with schizophrenia-spectrum disorders with the digital therapy intervention for a period of 3-6 months post hospital discharge. The study evaluated 342 participants between 18-60 years of age, who had been diagnosed with a psychotic disorder and were discharged from a psychiatric hospitalization within 60 days. The study, supported by a grant from the Department of Health and Human Services, Centers for Medicare & Medicaid Services, is to date the largest and longest study examining the interaction of patients with schizophrenia with a digital therapy. The study demonstrated robust usage of and engagement with the research version of THRIVE. Seventy-four percent (73.6%) of patients were successfully able to use the digital therapy 3-6 months after discharge, and on average, participants used the digital therapy for 82% of the weeks they had a mobile phone. The study found that patients engaged with the app every other day, and when engaged, they used on-demand features more than once per day. Patients who used the app for the entirety of the study averaged 4.3 days of use per week. In previous studies, the digital therapy has shown efficacy in treating schizophrenia across a 33-patient longitudinal study where patients demonstrated an 8% improvement in the Positive and Negative Syndrome Scale (PANSS), the primary endpoint in clinical trials for schizophrenia treatments. 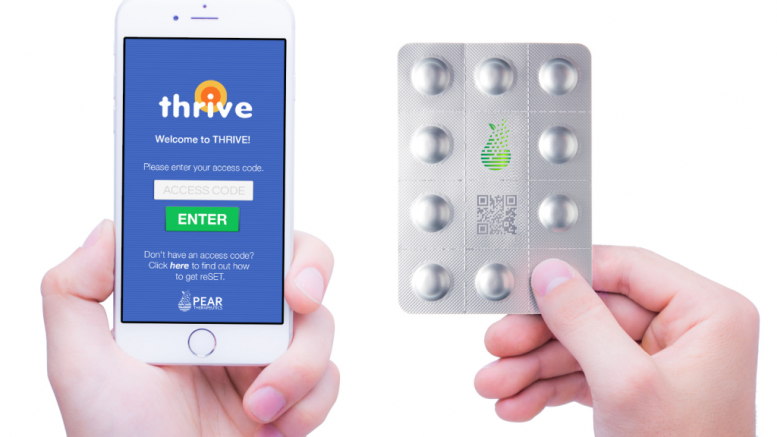 Study participants, already taking antipsychotics at study start, were offered access to the research version of THRIVE and followed over 1 month of use, during which time patients engaged with the digital therapy 86.5% of days they had the device, an average of 5.2 times a day. The research version of THRIVE is being or has been evaluated across 7 clinical studies in 504 patients. “Patients with schizophrenia are traditionally considered a high risk patient population and the period immediately following hospitalization is of particularly high risk. This study debunks the concern that patients who are not clinically stable are not capable of using mobile interventions,” said Dror Ben-Zeev, PhD, Director of the mHealth for Mental Health Program atDartmouth College. “Coupled with prior results demonstrating enhanced outcomes in patients with schizophrenia-spectrum disorders, this study suggests that THRIVE could be an efficacious, long-lived therapeutic intervention. We are particularly excited to have the opportunity to bring THRIVE through regulatory approval and payor reimbursement. We are committed to making this product part of the standard of care for treating Serious Mental Illness,” said Corey McCann, President and Chief Executive Officer of PEAR.